possibly the sickest engine/tran package for an SLC ?? I have ordered the Carbon Fiber intake with a UV protective coating and will do whatever it takes to keep the upper engine bay cool enough. The larger space provided by the GT-R should make this possible. This is a big intake, so it is definitely not an option in an SLC. It is so impressive that Fran is willing to help out with the mock up to make sure this will work. Thanks Fran!!! I put a Harrop Hurricane cross ram (form Australia) fly by wire controlled cross ram on my 280Z conversion. With 58mm throttle bodies it will flow plenty of air for whatever you want to do to your engine. This intake should fit very nicely in an LS powered SLC. I looked at putting the Kinsler carbon fiber cross ram and the Harrop ITB in my SLC. The Kinsler is over-the-top cool but it hits the rear window -- could probably be made to work. The Harrop has been done twice that I know of. The issue is filtering. There is no room for a proper intake manifold so in both cases the builders went with filters on the trumpets which typically cancels any power gains (you still get the cool factor though). After a lot of back and forth I went with a Harrop supercharger instead. I am having Katech build the motor for my GT-R. We are starting with an LS3 block, adding Texas Speed LS7 heads, Katech valve train, a Performance Design Carbon Cross Ram Intake with Custom Throttle Body Adapters. Katech modified the Oil Pan and the Water Pump. The motor is built, waiting for the dyno. After it checks out, the Carbon Valve covers will be added and sent to SuperLite. Thanks to Katech and Fran for mocking up the motor in the GT-R to see what custom mods were needed to make this fit the space. The photo is the motor pre dyno. An engine from a Ferrari 458 would sound really great in an SL-C.
Just announced: Koenigsegg will supply Spyker with a 600 hp V8 that they think will last "200 years". 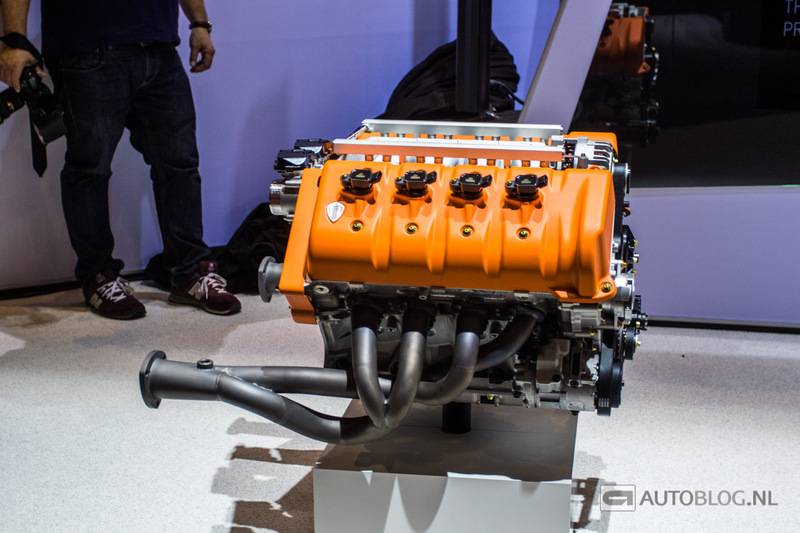 Audi is coming out with a multi-turbocharged V-8 diesel engine. Listen to these specifications!
. . . 435hp twin-turbo 4.0-litre V8 diesel and 48V-driven 'Electrically Powered Compressor' combination to the 4.9-second 0-62mph time . . . This is a properly rapid car. Not 'rapid for a diesel' or 'rapid for an SUV', just rapid full stop. Whatever it looks like and whichever pump it fuels from that's got PH merit. Like the previous V12 TDI Q7 this is one of those 'all about the engine' cars that geeks like us can appreciate too. The cylinder count and configuration are a sound start but the addition of the Electrically Powered Compressor to the two exhaust-driven turbos gives it astounding punch. The EPC's job is to prime the induction charge before the turbos have spooled up, the way the boost gauge shoots up before you even deploy the throttle offering the first sense of what it's up to. Suitably awoken, throttle response is razor-sharp, the V8's 664lb ft from barely more than tickover making a mockery of the SQ7's bulk. Acceleration is angry, quite frankly, and that sub-five 0-62 time feels a conservative estimate. Nor does that rate of progress abate either. There's some really clever stuff going on here too. This is the first time Audi Valvelift System has been used on a TDI engine and it uses variable opening of the exhaust valves to control the sequential turbos. At low revs one exhaust valve remains closed, gases directed to the 'active' turbo as Audi has it. Above 2,000rpm and when the loads dictate the second valve opens to wake up the second turbo. Before any of this has happened, of course, the EPC has already been on the case. And it sounds great too. There is a 'sound actuator' in the exhaust system but from the outside there's enough V8ness to suggest fakery plays only a supporting role. Suffice it to say even the tickover rumble inescapably signifies the SQ7's intent. n addition to this new electric turbo, Audi’s valve lift system (AVS) has also been integrated into a diesel engine for the first time. This system is rather creative and offers huge performance gains all the way around. Basically, each camshaft has two valve contours for each cylinder. For the intake valves, one contour is used for takeoff, in conjunction with the electric turbo. At higher speeds the second intake contour is optimized in filling each cylinder with air, providing more power at higher engine speeds. For exhaust operations, the contours are used to control the turbochargers. At lower speeds, one remains closed, preventing the larger turbo from operating. At higher speeds, the second valve is opened to allow the larger turbocharger to operate normally, and provide the power needed at higher engine speeds. In turn, this system provides exceptional torque delivery and response while offering, in conjunction with the electric turbocharger, excellent take-off performance as well. The most interesting part about this 4.0-liter is the reverse-flow setup of the intake and exhaust systems. On this engine, the intake is placed on the outside of the engine, while the exhaust outlets are placed between the two cylinder heads. This is opposite of most traditional engine designs, so expect to be thrown off a little bit if you’re someone who likes to perform your own maintenance. That 435 horsepower and 663 pound-feet of torque is sent to the wheels via a redesigned, eight-speed Tiptronic transmission. The entire setup allows the SQ7 to hit the 62 mph benchmark in 4.8 seconds on the way to an electronically limited top speed of 155 mph. According to Audi, the SUV averages 31.8 mpg, which isn’t bad at all. $118,000 SUV from Audi. Given VAG's spanking with dieselgate zero chance of that engine making it stateside. Coupled with VAGs recent corporate commitment to electric I doubt this motor is long-lived in even in the global market. I know, I know, it won't power an SL-C. But come on, a supercharged, 125 cc V-10 engine? That the guy milled out all the parts himself from billet? This thing is too cool. You gotta watch the video. Has anyone approached you about doing a VR38DETT out of a Nissan GTR in the SLC? I'm saving to hopefully put down the cash for an SLC next year after taxes (promised you I'd get an SLC.....and I plan to keep that promise). I have my GTM with the LSX and Graziano (thanks to your help) and now looking for the next bizarre project and I'm quite the fan of the VR38's after owning a GTR and think the emissions exempt SLC with a crazy VR38 build would be fun. Fortunately, it is now here. No offense to the LS crowd cause that's an awesome engine, but if I wanted a domestic DOHC V8 I think I'd go with the Ford series. Their crate Aluminator is 580 naturally aspirated horsepower. With an engine that was designed as a DOHC V8 layout. Nice motor for sure, but $8,000 more than the comparable LS. I like Ford, but not sure it's worth that much premium. The DOHC four valve Mercury LS engine is $8k cheaper than the Ford Crate motor? That's a pretty good deal. I didn't realize it was that inexpensive. Ron, the Mercruiser is 750hp. The drawback, is the last pricing I saw was $29,995.00. The last testing I read about, with it in the Ultima test car they were still having problems. I read they tried to sell it to Gm. They politely said No Thanks, we have our own new DOHC engine coming. That was on the internet, so it must be true (lol). Ah, that makes more sense. John was talking about a standard LS while I was specifically talking about DOHC V8s, which the LS isn't unless it has the Mercrusier package on it.